The Delhi 2010 Gold, Silver and Bronze mediallists will be determined at the Thyagaraj Sports Complex on Thursday. World champions the Australian Diamonds and defending Commonwealth Games champions the New Zealand Silver Ferns will line up in a fourth-consecutive battle for Gold at 13.30. Australia stamped their spot in the top two with a tough 51-45 win over England in Tuesday's first Semi-final, while New Zealand enjoyed a comfortable 59-43 second Semi-final victory over fourth-ranked Jamaica. Keep an eye on the expected match-up between 38-year-old Irene Van Dyk (NZL), who is coming off a 32-goal (at 100 percent accuracy) Semi-final haul, and 23-year-old destructive goalkeeper Laura Geitz (AUS). History favours Australia who, since Netball's debut in the 1998 Kuala Lumpur Games, has collected two Gold medals to New Zealand's one. A disappointed England outfit will take on Jamaica in a battle for the Bronze medal at 11:30. 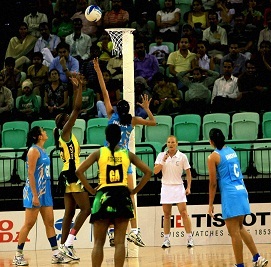 England, the 2006 Bronze mediallists, came close to beating Australia and will be keen to avenge the loss with a massive margin against the Sunshine Girls. Jamaica, who finished fourth in Melbourne, losing to England in the Bronze medal match, need to string together four consistent quarters to have a chance of collecting the remaining medal. Romelda Aiken (JAM) is heading into this battle as the sharpest of the shooters with a Games average of 90 percent (198/220), but watch out for England defender Geva Mentor (ENG), who is averaging between three and four intercepts a match.